Projekte: Wir führen Ihre Projekte durch. Audit: Gemeinsam identifizieren wir Bereiche mit Verbesserungspotential und führen Projekte durch um Ihre Umsätze zu maximieren. Having average occupancies above 90% for the whole market means there are a lot of days where hotels have the opportunity reach 100% occupancy! Assuming this amounts to 100 days over the year where a hotel could sell 100%, and they leave 10 rooms with a selling rate of 150eur unsold each day by not applying overbooking, the hotel’s loss would amount to 150.000eur in just rooms revenue! (100*10*150=150.000). We can all agree that cancellations and no shows exist. One thing for certain is that if you sell a hotel to 100% occupancy 1 month in advance of arrival, leave it closed and never reopen for sale again, the hotel will get cancellations and you will end up with rooms free at the end. The trick and what you should do is to establish your cancellation and no show factors, preferably per segment. You can calculate this by looking at reservation data reports showing you cancellation date and arrival date. As you can imagine you will have more cancellations over a longer period of time, and therefore I recommend to, depending on the nature of your business, define distinct cancellation ratios for different periods in advance to arrival. When your ratios are defined, you can then use them to know by how many rooms you can overbook. Say for example that within 1 week you overbook with 5 rooms, 1-3 weeks 10 rooms, and over 1 month out with 15 rooms. And on the arrival date itself, it is important to base your overbooking level on your no show ratio per arrival room. Furthermore, you must consider factors such as length of stay (LOS) and early departures. Bad data in is bad data out. Hence to arrive at accurate cancellation ratios and no show factors it is important that front office tracks and handles reservations correctly. Do not for example check in no shows to boost your occupancy! It will only distort your numbers and eventually lead to incorrect overbooking levels and loss of revenues. I am pretty sure both your competition set reporting and also the fire department prefers the true scenario being tracked in your PMS in case of emergency. How much should you overbook? Does overbooking mean turning clients? Bluntly put, unfortunately yes, some. In theory and also in practise, there is no scenario in which you manage to sell out 100% on all your incremental demand days without having a single turned guest. It is a statistical fact and in the end a choice one must make depending on how much risk you want to take versus lost revenues. The sooner your front office and reservations department realizes this, and prepare for this, the better you can handle the situation. So how much should you overbook? From experience, I would say that a reasonable level of overbooking should be the following: Out of 10 days with incremental demand, you manage to reach 100% occupancy on half of those days. Out of these 5 full days, you should turn clients on maximum 3 days. I know it’s not optimal, but statistically necessary. If you turn less, than you are too risk avert, leaving money on the table. If you are turning even more, then you’re probably taking too much risk, negatively affecting your brand and image. As pointed out before, the best way to handle the situation is by having a prepared staff and a good standard operation procedure (SOP) in place. Here you should make sure you have a set list of hotels that you cooperate with when sending guests. Front office team members, reservation and especially night audit should have a good contact and preferably know their counterparts at these hotels. If you are a chain you of course use the connections to your own hotels. Good personal connections are good for getting a more flexible cancellation policy when you are in need of holding a reservation and getting the best possible prices. If you are lucky you can even make extra revenues by reserving a cheaper rate at your competitor hotel than what the guest has booked with you. In either case, whether you are sending guests within your own chain or to competitors, be sure to upgrade to an equal or even better hotel, and use the better hotel as soon as you have a guest that is angry and make it a positive upsell. Pay for taxi and phone call which is standard, and of course a signed letter from the GM. What you definitely don’t want to do is to act rude and become the United Airlines of the hotel industry. With good SOP your teams will be better prepared and feel better when handling an overbooking situation. Another advice is not to act too soon. 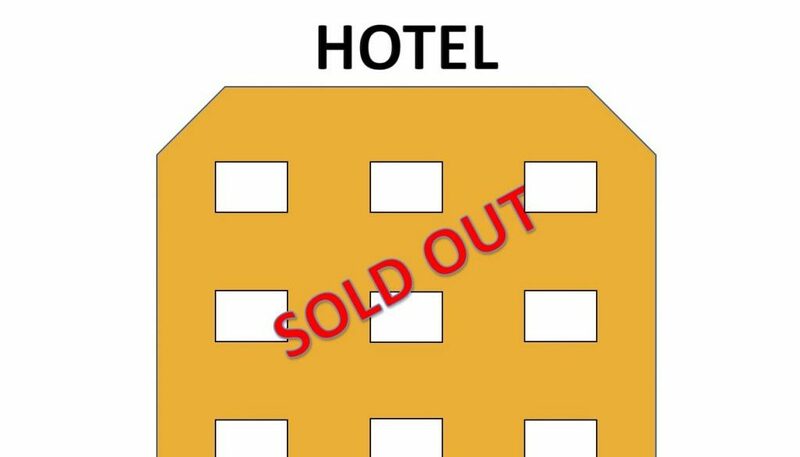 People tend to panic and waste time on booking out in advance, and in the end the hotel opens up for sale again after some late cancellations. To remove some of the stress it is important to know your cancellation ratios and make sure all team members from different departments understand how much cancellations usually come. So, don’t block space at competitor hotels when you don’t really need it. Let your staff focus on other important tasks instead, and make sure you keep a good relation to your competitor hotels to ensure a smooth handling for when you really do need their help. I often hear hoteliers saying they don’t want to overbook for a fair because then everyone arrives. However, looking at your data I can assure you that a fair doesn’t mean you won’t have no shows or late cancellations, quite the opposite in fact. What is different however is of course that you have less opportunities of competitor hotels to turn to, meaning you should overbook a bit less and be on the safer side, but still overbook. Don’t forget, the selling prices for a fair can be several hundred percent higher than your normal rates, meaning a big revenue opportunity! Another myth is that you can only overbook the arrival day of the fair as that is the only day when you have a lot of arrivals. On the other nights of the fair when you have very few arrivals, the common perception is not to overbook those days. This is however not true and the LOS plays a big role here. Just as it is true that you have most arrivals on the arrival day of the fair, it is at the same time true that these guests stay for many nights of the fair, i.e. having a longer LOS than normal. This means that a cancellation you get for a room on which was scheduled to arrive at the arrival day of the fair, will affect also the following nights. Therefore, you should make sure you overbook all the nights of the fair taking both LOS per arrival and amount of arrivals per day in to consideration. Lastly, don’t forget to consider your early departures. Define your cancellation and no show ratios based on accurate data, decide how much risk to take, and put in place a good SOP for how your team can handle an overbooking situation. With that we wish you a successful overbooking strategy and I am confident that you will witness a substantial revenue increase from occupied, higher priced and profitable rooms!